Tearing up many RPG conventions that its publisher Square Enix put into place, The World Ends With You is vibrant, energetic and an absolute blast to play. You play Neku Sakuraba, a young Japanese kid who wakes up with no recollection of who he is or how he got there. So far, so standard, right? It would be, except for the fact he wakes up on the street in Tokyo's ultra-cool Shibuya district with a pinbadge that lets him read minds. Teaming up with a young girl named Shiki, he sets out to discover the truth and return to the real world. Elements may sound formulaic but it's a thousand miles from the majority of RPGs: Neku must escape the Reaper's Game, a meta-game that sets a main challenge to accomplish each day, and dividing the story into short chapters suits the handheld format perfectly. Along the way, there are moments of surprising emotional depth and plenty of well-written dialogue, with enough twists to keep you guessing until the end. 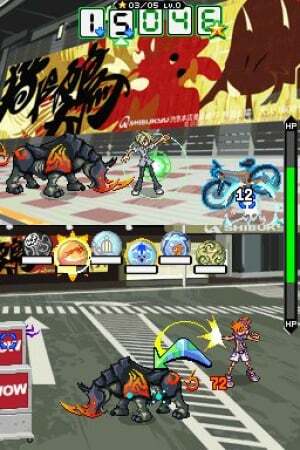 Undoubtedly the highlight of The World Ends With You is the real-time battle system that succeeds where so many RPGs fail in allowing you create a truly unique fighting style. Neku can equip various pins that grant him attacks ranging from bullets to psychokinesis as well as defensive moves and health restoration, and you're free to equip these in any combination you choose. Controlling Neku with the touchscreen, you can slash, swipe, tap and circle to activate the pins, and learning how to combine attacks for multiple hit combos is satisfying and elevates the battle system far above the simplistic brawler it could have been. As you progress and gain experience your pins improve as well, dealing more damage and sometimes evolving into more powerful attacks. In fact, your pins even improve when you're not around: save the game and return to it later and they've gained Pin Points, adding extra incentive to keep returning, though you won't be lacking in that. Tapping enemy Noise icons in the overworld initiates battle; tapping multiple icons chains combat rounds together, increasing the rewards whilst also upping the difficulty. If you find combat still isn't yielding enough rewards, you can improve the drop rate by decreasing your level, temporarily sacrificing power for pins, and fighting well increases the amount of Pin Points you gain from battle. What sounds like a complicated battle system is remarkably exciting: it challenges the player to push themselves for more reward, always making you ask if you could lower your level a bit more, or initiate one more round of combat. Then there's the dual screen battling to add to the mix. Whilst Neku occupies the touchscreen, his partner lives on the top screen and is controlled by the D-Pad (or face buttons if you're a lefty). Whilst your partner can't move freely like Neku they can attack with button commands to move through an on-screen combo chart, with combo finishers moving a "light puck" between characters that increases the holder's attack. The key to success in tough battles is to manage both characters equally, and there's something unassailably satisfying about dealing huge damage with both characters before finishing off your opponent with a team-up Fusion attack. If the dual screen combat isn't for you, set your partner to automatic in the options: remember, you're in control. There's similar levels of innovation outside of battle. In a world where style is everything, your clothes and pins can help you power-up in battle: trend charts reveal which brands are popular in your location, and switching attire accordingly yields statistic boosts. Feel too attached to those knee-high boots to swap? No problem: keep fighting and you'll popularise the brand, increasing its power. Yet for all this talk of combat and style, the game's strongest characteristic is its spirit: like Jet Set Radio before it, it makes its surroundings come alive with ambient sounds, a fantastic soundtrack and an unquantifiable sense of ‘cool’. Graphically gorgeous, with intricately detailed sprites and backdrops punctuated by hand-drawn cutscenes and portraits, there’s always something to draw the eye. The audio accompaniment ranges from J-pop to rock and electronica to elevator, with crisp vocals and well-sampled speech in battles and certain cutscenes. 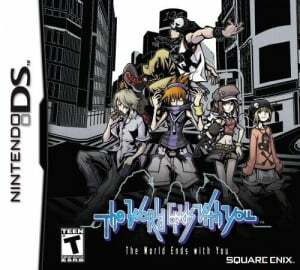 The World Ends With You is a mass of innovative ideas stylishly combined into a beautifully presented package. 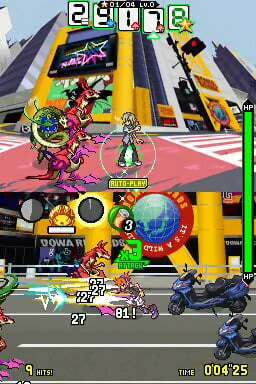 Its battle system, although complicated, can be tailored to suit each player’s style, and the flexibility displayed throughout the game is highly commendable. The end result is an RPG that’s every bit as unique as the person who plays it, and that is truly rare. The touch screen combat can be very imprecise. When you're trying to use one attack, frequently you'll end up using a completely different one. The story is excellent, as is the innovation and customization, but the touch screen combat does bring it down a little. This does seem interesting! Great review! I don't get why this game has such a "following". This is still on my To Buy list. Actually, I'm going into town today. It's going to be a fight between this and Tatsunoko VS Capcom, if I get anything. Hello everyone, this is my first post on NintendoLife . TWEWY is definitely the best game I've played on DS. Everything about it is unique and interesting - especially the story and its characters. This is a really memorable game that I recommend to everyone. Moco Loco, in combat, if you have pins which use the same touch-screen command, then they will clash with each other and you won't get to use the attack you want. That's why there's a "sub-slot" system where you can assign some pins to only work if you're holding down one of the shoulder buttons. If you use this, then you should have no problem with combat controls. I agree TWEWY is one of, if not the, best game on DS. I'm curious why the 9 instead of the 10, though. I'm not gonna hate for missing that point, but your review doesn't really point out any flaws. And Moco Loco, I never had any problem with misread inputs either, maybe Hyst815's suggestion addresses your problem? It Won Best DS Game of 08. That why I pick it up. One of my favourite DS games. Bought this to play whilst on holiday and could not put it down. The story was fantastic, the combat was fun and I love the characters aswell. this is THE most complicated game I've ever played. In fact, it's too complicated in my book. The battle system alone requires me to concentrate on more things at once than most other games, and if it were a slower paced game, I could probably handle it, but as it stands, it's just too much for me. I know there's the difficulty slider, but I'm way too stubborn to use that, plus the fact that it takes away gameplay elements doesn't sit well with me. I'd feel like I was missing out on the full experience, and I'm not having that. I loved this game. The combat system is amazing plus it has a very interesting story full of twists. In all honesty, I fully believe it's the best game on the DS. I understand why it got a 9, though. Really complicated, and the story ends a bit too soon. I wish the review would have pointed out some coherent flaws that I just mentioned, but it didn't. Great story, fun combat, but something held me back from fully liking it, maybe the dual-nature of the combat was distracting, so I'd prolly give it an 8. I still haven't got this yet but I'll definetley get it sometime this year. The characters and story look really good which is something I like in games especially rpgs. A lot of other people have pointed out that the game is almost too complicated, which may be why I let the touch screen controls get in my way. I do seem to have problems with stylus-based touch screen controls when there's too much going on; for instance, a lot of people love Elite Beat Agents, but I got very frustrated trying to hit the right thing at the right time and do all the slides without it misreading what I had done. I think you've pretty much hit everything I loved about the game. Fantastic story, great humor, awesome style, unique combat system, and the best soundtrack I've heard in years! Easily my favorite game of all time! I'm glad you guys finally got around to reviewing it! Amaaaaazzzing game, there's nothing like it. The fighting does take some getting used to though. Great game, but obviously not for everyone. While I'd much rather stick with a more traditional JRPG, this game is certainly a nice change of pace. I'd give it a 10/10, as it's only the best game on the DS. I've tried on a couple of occasions to get into it, but it just hasn't clicked with me. Next time, I should try be more patient with the battle system, because I think that's been the thing that's frustrated me. it's a good game, but I think I get the lack of 10/10. It just doesn't have a wide-enough appeal--battle system is a hair too involved for the casual, story is a bit too emo-ey for the non-13 year old with in-tact wrists, etc. Fun game, but 9 is as good as it deserves in my book. If you guys think this is complicated good luck playing Knights in the Nightmare. "A game that scores a nine should be considered a must buy for fans of the genre. Of course if we give a nine to a racing game and you only enjoy RPGs then this probably won't change your mind." That absolutely sums up how I feel about this game. It's remarkable and innovative and beautiful but as Corbie says it's definitely not for everyone. Me, I loved it - talk about it almost every day. By far the best game on the DS. I guess not everyone will be good enough to play and like this game but it outclasses any on the DS by far so a 10 is the only thing it deserves imo, but I guess that's a good enough reason to give it a 9. Love this game like heck. :3 The learning curve is pretty steep, though - it takes a while to get used to it, which is why a 9 is a good rating (even though the fanboy in me demands a 10). But... this game came out ages ago. Why are you reviewing such an awesome game now? This is THE best portable game for me. I´ve played through it and after a confusing start I was hooked. Once the bosses got harder, i learned how the battle sustem works, and it´s a revelation. @Kurona Sadly we just don't have the time to review every game at launch and this is one that slipped the net, but thanks to overwhelming demand it's available now. The system works! i got this game when i went on vacation to the beach last year. because of this i probably went outside the condo once when i was there and by far it was the best vacation ever. This game is on my huge backlog of Stuff to Get. Can I hear "TWEWY 2" for 3DS? Eh? Anyone? I got put off this game when I saw all the emos were into it. One of the best games on the DS, as well as one of the best games to come out this generation. Definitely an amazing title. Great gameplay, and an incredible soundtrack. Yay, a review! Not only that, a good decent review! The soundtrack in TWEWY is one of the best out there. Still have to track down a copy of it. I think your review was zetta awesome James. My favorite game for the DS. Owning a DS without this game is like owning a car with no A/C. This is barnone the hardest game to score, it depends on the gamer's skills to determine their performance and thus what they feel about the game. But seriously this is the most well layered game on the DS, so much in fact that it's packed with discovery and style that rivals any RPG I've EVER played, it's a game changer and the game changes depending how you play. What I've learned from this review alone about this game makes it even more awesome. I had no idea my pins though currently being unused have gotten pin points WHILE MY GAME IS OFF. Holy crap, Square-Enix is the KING of innovation in RPGs, if only Game Freak would get a whiff of their brilliance. Nice review! Doesn't seem like my style, but everyone tells me how good it is, so I should probably give it a go! And I'm glad you were able to come across the suggestions list I formed from everyone's suggestions Prosody! Haha, you pleased quite a few people with this. @Prosody Haha, I don't think ANYONE expects you or any of the staff to do all of those, it is just something to go off. Its a good game still need to get it. Would this game still be easy for me even I'm a girl? 'even if i'm a girl'? are you serious? does being a chick automatically handicap you in terms of what games you can and can't play? I must've missed that part of the 'How To Be a Girl' handbook or something. Oh my word, I love this game. Played it through at least 3 times, using different pins and attack styles made it into a new game each playthrough. The combat system is pretty complex, sure, but once you get the hang of it and start seeing big 3X passing between your characters it's an absolute blast. I think they could have improved the brands, the only time it really affected me was in Pork City (darn little piggies...). The characters were awesome, although Beat cussing every 3 seconds in combat got annoying . Overall, the game is incredibly fun. I give it a thumbs up. Great game, I can see why some people may not like it though. @TBD I think I missed that handbook too. Oooh, anime.... Hmmm, but I'm no good at RPGs. Especially if the battles are hard. And, according to a lot of these comments, it is. Ahhh....brings back memories. I remember picking this up just cause I saw Squeenix made it....back then I thought that was a good enough reason to buy games. I thoroughly recommend this to anyone who has a (3)DS(i). If you do not play this, Chuck Norris will exact vengeance on your family. Aaand you'll be missing out on one of the greatest games available on the handheld. My brother loves this game. gives a 9/10. I gotta play this! God I LOVE this game! Last copy in my city too:) I was a little annoyed with the emo Neku at first but HE CHANGED and I FREAKING LOVE HIS CHARACTER NOW. I understand why you might be squinting at this game, wondering if it's worth it. I believe this is one game you MUST try out before you die-all the way through the story. I finally found a game that made me realize why I love video games again after so many meh games. 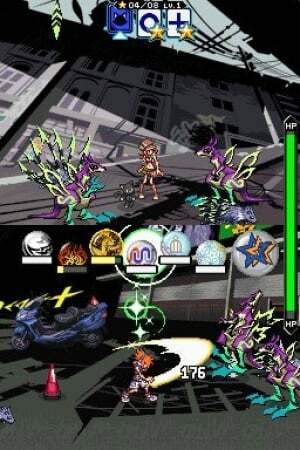 Does anyone know of a Ds or GBA or 3ds game that has a very good story like TWEWY? I have played and own Fire Emblem Awakening, RF4, Shin Megami Tensei 4, Radiant Historia, 999 , Virtue's Last Reward, Hotel Dusk, Chrono Trigger, FF4, Tales of the Abyss, and The Zelda games. I want a really good storyline more than anything.